Before, we were Ascension Dance Company, Shoot Festival gave directors, Ben and Ashley (AJ) the chance to produce and showcase work. They offered us a platform to explore our creativity, providing the support to find our voice as artists. This opportunity fuelled a creative bug and enabled a shift in mentality that made us realise that ‘we can’ create work, and not only that, but the work we create is of a professional standard. Shoot provided feedback on our work and allowed us to produce and market our performances. As graduate performers and artists more used to performing for established dance companies and arts organisations, this opportunity to self-promote was priceless. It gave us an insight into the work required behind the scenes to produce your own show. 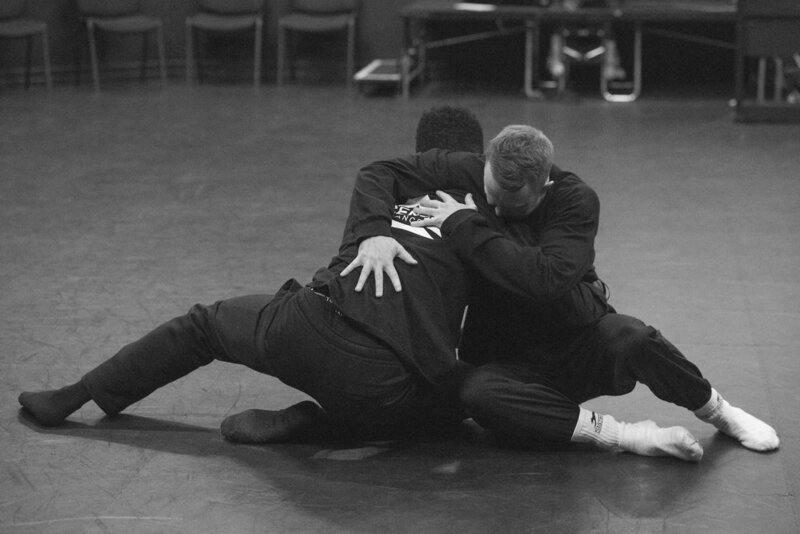 ‘Beat’, originally created under the guise, Kinfolk Collective, was a solo interpretation of a previously performed work produced by Shoot and reworked by Ben Morley. We were commissioned by Shoot Festival in 2017 and ‘Beat’ became part of their 2017 Triple Bill (now called In Bloom), which encouraged us to continue to create work which is longer in duration and of a higher standard. With a script written by Mark Worth (Highly Sprung Performance Co), Ben’s initial stimulus looked at the effect of music and how different genres could inspire people to move differently. Mark’s script gave this piece a narrative that helped tie the dance elements together. Debuted at Shoot Festival 2017, ‘Beat’ included headphones, spoken text and touched on the theme of love. Having the opportunity to showcase ‘Beat’ and receive feedback enabled us to go on and further develop this work. Under the arc of Ascension Dance Company, we were able to take ‘Beat’ back into the studio to refine the piece. In the 18 months since debuting ‘Beat’ at Shoot Festival, we have toured the work to six other venues across the UK and are currently looking for more platforms. We are currently developing our second piece of work that looks at masculinity in society. This work has already been commissioned by Serendipity for Let’s Dance International Frontiers festival 2019 and will be performed at the Curve Theatre in May 2019. It’s been a patient and supportive journey for me, Ben and Ascension Dance and Shoot Festival offered us a springboard to start developing work and we could never have predicted the journey that would take us on. If you are one of those people thinking about applying for Shoot Festival, stop thinking and send in your application. Whether you are an actor, dancer or musician, this could be the opportunity to develop an idea that you have been sitting on, and that idea with Shoot’s support could be the start of your creative journey. Shoot has helped so many CV based artists to understand their potential, so let Shoot Festival shine a spotlight on another CV talent….